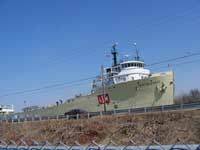 Ships have routinely been hoisted up and down the escarpment for over 150 years. Engineers have perfected the method of letting water and gravity do the work of filling and emptying locks with water flowing downhill from Lake Erie towards Lake Ontario. The canal was originally constructed in 1829 to offer ships a safe detour around Niagara Falls linking lakes Erie and Ontario. It began at Port Dalhousie and ran along Twelve Mile Vreek to Post Robinson where it connected to the Welland River. The Welland River joined the Niagara River exiting to Lake Erie. Construction took from November 1824 till November 1829. By 1833, five more locks were added for a total of 40, the feeder canal was expanded and a more direct route from Port Robinson to Port Colborne was constructed. It was now 43.4 km long and 2.4 meters deep. William Hamilton Merritt was responsible for starting the project and is considered it's founding father. The total cost of building the canal was 8 million dollars. European immigrant construction gangs used picks and shovels and were paid a half dollar a day. Horses and oxen were used to tow ships from one lock to the next. It ran from Port Dalhousie to Port Robinson and on though Welland and Port Colborne to Lake Erie. The second larger canal was built to accommodate increased traffic and larger ships. 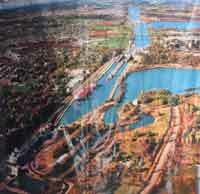 The Government of Canada had purchased the canal from the Welland Canal Company the year before the expansion. Construction began in 1842. The number of lift locks were reduced to 27 and the locks were extended from 33.5 meters to 45.7 meters. The locks were no longer wooden but limestone and their width was increased from 6.7 meters to 8.1 meters. By 1853, the depth on the canal was 3.1 meters. This canal took a straighter route from Port Dalhousie to Allenberg. From Allenberg, is continued basically as before. Construction finished in 1887. This canal had water supplied directly from Lake Erie through the canal itself. The canal now measured 4.3 meters deep, had 26 stone locks with a width of 13.7 meters and length of 82.3 meters. It was constructed from 1913 to 1932. It was initially 7.6 meters deep, deepened to 8.2 meters, and now is 9.1 meters deep. The canal starts at Port Weller and continues straight to Port Colbourne. In 1967-1973 a bypass was constructed around the city of Welland to alleviate city traffic and help speed ship traffic through the canal. The twin flight locks in Thorald allow ships to travel in either direction at the same time.